Naturaful highly recommends using at least 3 to 6+ packs for noticeable and effective changes. Each pack includes 1 Naturaful cream & a box of 5 pairs of Naturaful enhancement patch. Your order is reserved for 4:32 minutes! SAVE an additional $20 OFF today! But be quick, this Discount will expire when the timer reaches zero! Your purchase of 6 pack of NATURAFUL Shipped to you every 2 month. Cancel Anytime. 60 DAY Money Back Guarantee. NOTICE: Due to high demand, please allow 5-10 days for shipping within US. Your purchase of 3 pack of NATURAFUL Shipped to you every month. Cancel Anytime. 60 DAY Money Back Guarantee. NOTICE: Due to high demand, please allow 5-10 days for shipping within US. Your purchase of 1 pack of NATURAFUL Shipped to you every month. Cancel Anytime. 60 DAY Money Back Guarantee. NOTICE: Due to high demand, please allow 5-10 days for shipping within US. This selection is a one time purchase. 60 DAY Money Back Guarantee. NOTICE: Due to high demand, please allow 5-10 days for shipping within US. 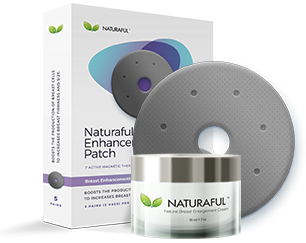 Get 2 more packs of Naturaful Patches to accelerate my breast enhancement. Regular Price: $80 Promotional one time offer for only $49. This offer is excluded from subtotal.